There is no proven cure for Sudden Oak Death. But that doesn’t mean you can’t find people selling cures. In fact, the Internet is full of theories – and their related products – that explain how to treat Sudden Oak Death. The problem with them, says UC Berkeley researcher Matteo Garbelotto, is that they don’t work. And in fact, he adds, they could actually harm people’s backyard oak trees. One of the most popular treatments says that part of the problem with oaks is that they’re weakened by acidic soils (presumably from acid rain), and the theory is that heavy doses of calcium in the soil could restore natural balance and strengthen trees against the Sudden Oak Death pathogen. In hopes that the theory might bear fruit, the Garbelotto lab recently tested it. 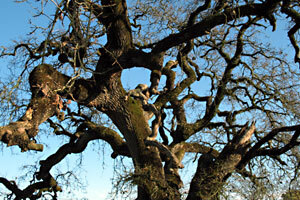 The study found that it did nothing to stop the Sudden Oak Death pathogen. In fact, Garbelotto said, it’s like giving a glass of orange juice to someone with a terminal disease. And in some cases, he added, it could have a detrimental effect. A different Garbelotto study showed that a phosphonate fungicide, brand-named Agri-Fos, can prevent the onset of Sudden Oak Death, for a period of about two years. This is the only product on the market that is effective, he said – not as a cure, but as a two-year preventative. Some people who love their oak trees decide to try both treatments, Garbelotto said. And since the phosphonate that does work is acidic, and the calcium treatment that doesn’t work is basic, then you could end up inhibiting the treatment that actually works. That is, if you use both treatments, he said, the calcium could actually negate the positive effect of the phosphonate. From 10 a.m. to noon on Sunday, May 16, Garbelotto will lead a “Sudden Oak Death Blitz” at the East Bay Parks Botanic Garden in Berkeley’s Tilden Park. The event, sponsored by the California Oak Mortality Task Force, trains participants to spot vegetation infected with P. ramorum and collect samples for testing. The training is useful for homeowners who want to monitor their own trees for Sudden Oak Death. Listen to the Sudden Oak Death radio report online. thanks for story. I live in Canyon (Contra Costa Co) where we are witnessing a transformation of our area because of this. Enormous splotches of orange spheres (dead trees) on every slope. We began injections of trees on our hillside but had already lost two trees (dozens more on the property). Where has the balance in reporting gone? I am a leading scientist in this work to improve oak health using calcium-rich fertilizers and other fire mimicry practices. Why no call? Readers will have to do their own investigating if they want to know the real story here. For starters, check out http://www.suddenoaklife.org. I have used both treatment and have found great success using Agri-Fos and that the mineral treatment did not work as well on my oak trees. Agrifos and pentrabark should be applied 2x per year as a basal bark spray. Good that you care enough about your oaks to try both approaches. I wonder though, did you just spread minerals or did you follow the whole fire mimicry protocol? Fire mimicry involves a lot more than just applying minerals. There’s also clearing, excavating, pruning, power-washing, thatching, composting, mulching, etc. Minerals and fertilizers often need to be reapplied and extra watering is needed for some oaks. Folks should keep in mind that severely diseased trees will reach a point where probably nothing can be done to save them. Best to make the efforts to help the trees before they become too ill.
to clear, power wash and excavate, before they put sprend the minerals and painted four of our oak trees. All of our trees were not severely diseased and were worth saving. We still felt that the Agri-Fos saved our trees, with much better results. I don’t think researchers set out to disprove the lime wash and azomite method, as is implied by some blog comments here, but rather to find out if that method was effective. It was disappointing, at least to me and possibly to them, to discover it was not effective. I think the problem is that Dr. Garbelotto is making the same mistake the entomologists made over 10 years ago when they said that the ambrosia beetles were killing the oaks. He now says the fungus alone is killing the oak trees. There is very strong evidence that the trees are being predisposed by other environmental factors like acid rain. However, rather than include other ecological scientists in the investigations, he is instead excluding them. I don’t blame him, in today’s academic environment the statement “publish or perish” is stronger than ever and scientists in academia are forced to find their own funding to support their theories. In this kind of scenario we may never know the real truth behind what is causing so many trees to die in California and elsewhere for that matter. This is very sad and unfortunate for the trees and their owners. Calcium additions are and have been made worldwide for more than 50 years for ailing forests. The benefits are numerous and cannot be explained in this short paragraph. That is why I posted the videos earlier. I suggest you view them and you will learn more precisely what is happening to our forest trees- acid rain is a silent and invisible killer of trees. Again, why no balance in reporting this piece? Did you actually read Garbelotto’s research article in California Agriculture? If you did you would have been amazed that his claims against my work are based on all of 5 trees that were tested with lime wash and azomite. Oh, and why did the oaks in the uninoculated control group develop lesions? Garbelotto’s own published results show there is a serious contamination problem in his lab. This study is a mess. I’ll have plenty more to say about it on my blog, Sudden Oak Life. People need to realize that Sudden Oak Death is not the real problem with our oak trees. If you are going to get any results from a calcium study it really needs to be “long term”. Short term studies with calcium are basically useless. Here is an example of a long term study on sugar maples from a very reputable group of scientists on the east coast. You may be helpful to pass this along to Dr. Garbelotto to read. Which brings me to OPINION. How close does this article come to slandering your good name? Got any attorney friends? I would ask them to take a look at it. David Gorn might not have come right out and called you a quack but he less than cleverly alluded that with his first paragraph. And by leaving out your credentials and misstating what you actually do say on your website. Oh yeah, he forgot to mention that too. And he maligned the mineral product that you use, so that company might want to have their lawyers look too. I am not litigious but when a big multi-million dollar business who claims to be ‘public’ allows shoddy work like this article it is really malevolent. Again, my opinion. Another example of sensationalistic irresponsible corporate driven ‘journalism.’ Of course, that’s just my opinion.